Tough Dudes, Soft Craft: Men Getting Crafty - craftivism. By Betsy on April 1, 2010 in crafters + makers., feminism + human rights., friends + loved ones., lovely, modernity + sociology. This story has made its rounds on the US craft blogosphere yesterday, but for those of you farther afield, I wanted to post about it in case you haven’t seen it, Idle Pastime: In Off Hours, Truckers Pick Up Stitching. I especially adore that when the man in the video was interviewed he was waiting to pick up his next delivery load: 45,000 pounds of Spam, which, seems quite manly, don’t you think? I think timing is quite interesting given the Quilts 1700-2010 show at the V & A Museum that just opened is showing off the work of some stitching inmates trained by Fine Cell Work. There with all the historic quilts is a quilt made by the tough guys. There is a lovely video about their work over here, if you haven’t seen it already, please go check it out. There is also a little bit more about the truckers sewing above over here. Just as craft hit a point 10 years ago where feminists began to embrace craft, have we reached a point where men are beginning to embrace it more and more? Just like feminists took back the kitchen and the knitting needles, are men finally getting hassled less now that craft has been in vogue for a decade? I’d like to think so. Although, just like with the feminists, as we heard such gender stereotyping nonsense like, “You?! You knit? I thought you’d be off giving people tattoos or in a mosh pit or not shaving your legs?” I think that the novelty factor inherent in men embracing craft is a bit sad. Why can’t men make “soft” things if they want to? After all, soldiers are given sewing kits to repair things in the field and wasn’t the toughest dude of the 80s, MacGyver, one hell of a crafty genius? 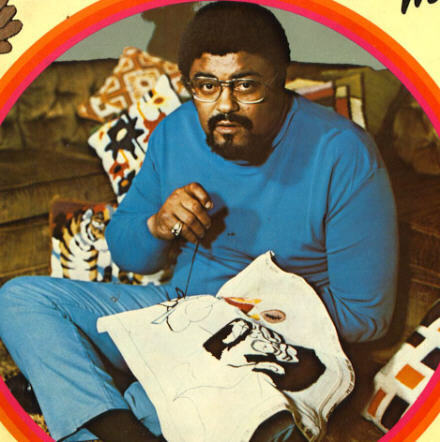 And who could forget, everyone’s favorite male stitcher former pro-football player Rosey Grier? And his 1973 book, Needlepoint for Men? Hopefully, just like all us feminists who finally get asked less and less why in the heck we’re knitting instead of doing something rough and tough, men who get their craft on will soon enough be seen as just normal (albeit awesome) guys that like to be creative. Because after all, there are plenty of single ladies (myself as well as many of my friends and peers) who think that a guy who can craft with the best of us, is pretty darn hot. So maybe next time you see a guy trying to impress a girl or guy they fancy by being reckless, you should take away the fire/speed/mass amounts of alcohol and hand them some needles and thread. And I’m sure there are loads I have forgotten to list here. Have any other examples of guys stepping out and up to the needle or hook? Roosevelt Elementary’s 2nd & 3rd Graders Rule! I loved the article about truckers making quilts and knitting. I think it’s great that, like you said, these “rough and tough” guys are crafting! Hey There!!! Thanks so much for the include. Loved this story and your blog post. Awesome post, Betsy!! I watched the truckers and the Fine Cell Work videos and was seriously impressed. So great. And I remember being in a vintage book shop like 10 years ago and seeing that Rosey Grier book, I sure wish I bought it!